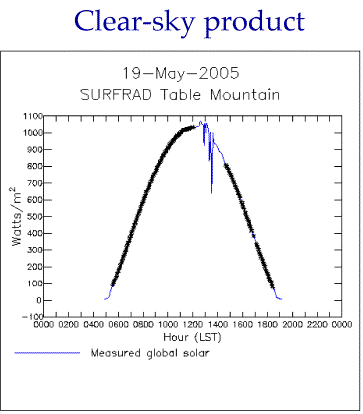 Global solar SURFRAD measurements marked with * in the daily time series above were identified as times of cloud-free skies. The afternoon clear-sky times are cross referenced with coincident MFRSR data to produce the calibration Langley plot on the right. Blue points are MFRSR 500 nm measured MFRSR voltages that correspond to the afternoon cloud-free times on the plot to the left. 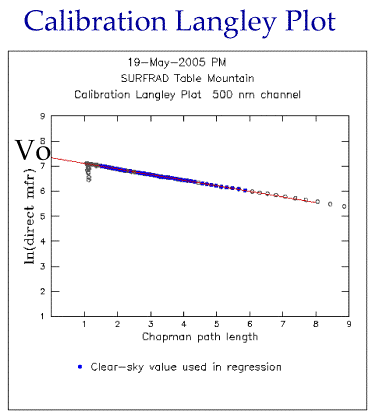 These automatically generated calibration Langley plots are constructed over one, or two-month periods and composited to identify a representative Vo for that period. Because calibration Langley plots are blindly identified by an automated process, some bad calibrations slip through, such as the bottom Langley in the two-month composite to the left---note the slight curvature in the bottom-most Langley plot. Statistical methods are used to screen out bad Langley plots and the result is a better sample of Vo's and reduced error for the two-month period.